The Northern Lights once again performed beautifully from Churchill, Manitoba, making the sky dance with colours. As I do each winter, I spent time in Churchill, Manitoba at the wonderful Churchill Northern Studies Centre, attending to groups of “aurora tourists” there to check an item off their bucket list – seeing the Northern Lights. In the 30 years the courses have been presented only one group has ever come away not seeing the Lights. Well, make that two now. A bout of unseasonably warm weather in my first week brought clouds every night. Mild temperatures to be sure. But we want it to be -25° C! That’s when it is clear. Our first clear night was very clear, affording us a wonderful view of the winter Milky Way before the Lights came out. Such a view is unusual from the North, as the Lights usually wash out the sky, which they did later this night. Even here, you can see some wisps of green aurora. Normal temperatures didn’t return until week 2 of my stay. The second group fared much better, getting good displays on 4 of their 5 nights there, more typical of Churchill. A few determined die-hards from Group 1 (here shooting the Lights) stayed on a couple of more nights, and were rewarded with the views they had come for. They were happy! In the images here, at no time did the auroral activity exceed a level of Kp 3 (on a scale of 0 to 9) and was often just Kp 1 or 2. Farther south no one would see anything. But at latitude 58° N Churchill lies under the auroral oval where even on quiet nights the aurora is active and often spectacular. In speaking to a Dene elder who presents a cultural talk to each of the CNSC groups, Caroline said that to the Dene of northern Canada their word for the Lights translates to “the sky is dancing.” Wonderful! It did for us. 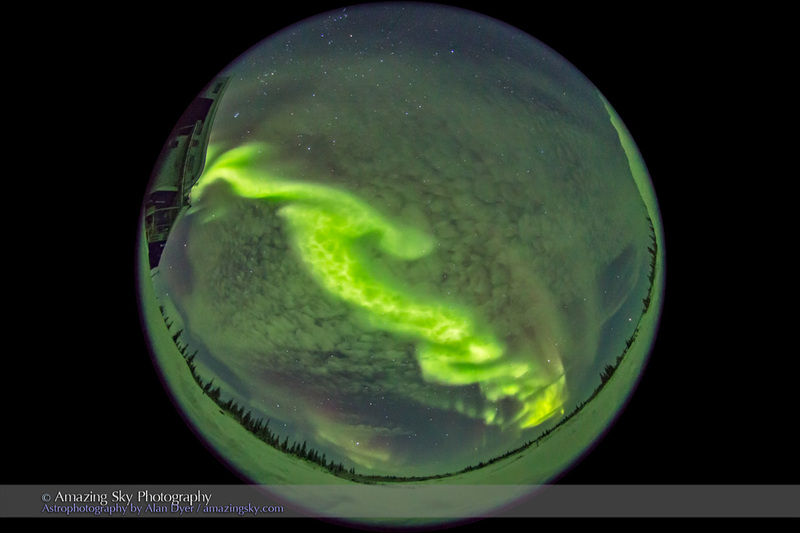 The Auroras of Churchill from Alan Dyer on Vimeo. This music video presents a montage of time-lapse movies I shot over four nights, from January 25 to 29, 2017. They provide an idea of what we saw under the dancing sky. As usual, choose HD and enlarge to full screen to view the movie. Or go to Vimeo with the V button. My latest music video includes images, time-lapses and real-time videos of the Northern Lights shot in February and March 2016 in Churchill. While I’ve posted my recent images of the aurora here and at many social media sites, all the videos I shoot take more work before they are ready to unveil to the public. Videos work best when set to music. In this case, I’m very pleased to have received permission from EverSound Music to incorporate the music of one of my favourite artists, John Adorney, in my latest music video montage. The selection is If a Rose Could Speak, from his 2013 album The Wonder Well. It features vocals by Daya. The video incorporates still images, as well as time-lapse sequences, and real-time videos of the Northern Lights. The all-sky time-lapses are intended to be projected in digital planetarium theatres, recreating the scene on their 360° domes. Please click on the V for Vimeo button to really see the video well. And select 1080p HD for the best image quality. And do share! I shot all scenes at the Churchill Northern Studies Centre, near Churchill, Manitoba, on the shore of Hudson Bay at a latitude of 58° North. Churchill’s location places it under the usual location of the auroral oval, providing spectacular displays of Northern Lights even on nights when locations to the south are seeing nothing. I was at the CNSC to present sets of 5-night aurora viewing programs to guests from across North America. Click the link above for more details on their programs. The 2016 aurora season is over, but we’ll have more aurora programs in January and February of next year. I shot all images with Canon 6D and Nikon D750 DSLR cameras, usually at ISO 3200. The fish-eye all-sky sequences were with a Sigma 8mm lens on the Canon, while most of the still images and other full-frame time-lapses were with the Sigma 20mm Art lens on the Nikon. For the “rapid-cadence” time-lapses I used 1- to 2-second exposures at an interval of one second. The real-time video clips were with the Nikon – set to ISO 25600 – and the Sigma wide open at f/1.4. While these clips are prone to digital noise, they do record the fast movement and subtle colour of the aurora much as the eye saw it. See my earlier music video with real-time clips shot February 12 for more examples of these. The all-sky sequences were processed through LRTimelapse v4 software, to handle the huge range in brightness of the Lights. Real-time video clips were processed in Photoshop with the Camera Raw filter. Temperatures ranged from a bitter -35° C to just (!) -15° C on most nights. I kept the long-duration, all-sky, time-lapse camera going by placing it in a Camera Parka (www.atfrostedlens.com) and inserting disposable hand warmer packs inside the insulated parka. It worked very well, making it possible to shoot for up to 3 hours. Without it, the battery died after an hour. It was a night to remember, when the sky exploded with a jaw-dropping display of Northern Lights. Warnings went out around the world and the aurora meters were hitting high numbers. By sunset we were charged up with high expectations of seeing the aurora in high gear dancing in the twilight. We were not disappointed. From our location at the Churchill Northern Studies Centre near Churchill, Manitoba (latitude 58° North), we see aurora almost every clear night, even when indicators are low. But this night, the Index was reading 7 on the scale of 0 to 9. I was afraid, after all the effort to come north to see the Lights, the Lights would abandon us and head south. Not so! The night did start with the Lights in the south, as shown in the panorama image at top. It takes in a full 360°, with the aurora arcing from east to west across the southern sky in Orion. The north over the Centre is clear. But the curtains soon moved back north and engulfed most of our sky for most of the rest of the night. Participants in our aurora tour group took their aurora “selfies,” and just looked up in awe at one of nature’s great sky shows. When the last of the group turned in at 2:30 a.m. the Lights were still going. What follows is a selection — just a few! — of the still shots I took. I also shot time-lapse sequences and real-time videos. All those will take more editing to turn them into a music video, still to come. 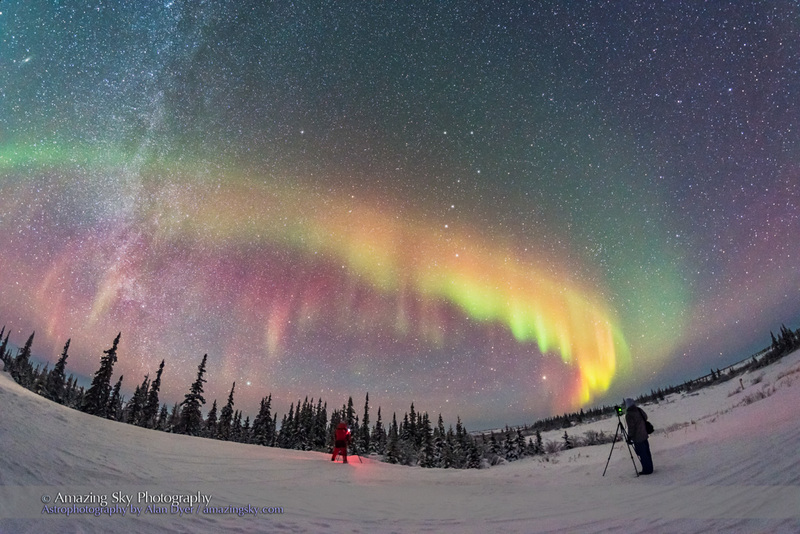 A lone observer gazes skyward at the start of a wonderful aurora display on March 6, 2016, as the curtains begin to appear and dance in the deep blue twilight. This was at the Churchill Northern Studies Centre, Churchill, Manitoba. A lone observer gazes at an array of colourful curtains of aurora during an active display, March 6, 2016, with curtains in the evening twilight adding blue tints to the sky and tops of the curtains, as well as the greens and reds from oxygen. Curtains toward the horizon are more yellow due to atmospheric extinction. Jupiter is rising at left, then near opposition. Auroral curtains converge at the zenith in the evening twilight during a Kp Index 7 night of aurora in Churchill, Manitoba. Blue twilight adds the blue tints to the sky and curtains. Our group of Learning Vacations tourists enjoy the start of a fine display of Northern Lights at the Churchill Northern Studies Centre, March 6, 2016. As curtains appear to the east, another array of curtains shines to the west behind them with a strong purple tint lighting the sky and ground. The Andromeda Galaxy sits amid the curtains. Aurora watchers looking south to a bright curtain of Northern Lights while other curtains rippled behind them to the north. This was a fabulous all-sky display, March 6, 2016. The temperature was about -25° C.
The green aurora lights the ground and snow green in a spectacular display March 6, 2016. This is looking northeast from the Churchill Northern Studies Centre, Churchill, Manitoba. The aurora over the Churchill Northern Studies Centre building, home to Arctic research and to many programs for tourists about northern ecology and science. The March Learning Vacations aurora tour group experienced a fabulous display this night, March 6, 2016. Some of our group of Learning Vacations aurora tourists outside the Churchill Northern Studies Centre enjoying the sky show on March 6, 2016 on a night with a Level 5 to 7 aurora. What do you see in the swirling patterns of aurora curtains at the zenith? They rapidly take many forms as they move about. This was the wonderful display of March 6, 2016. 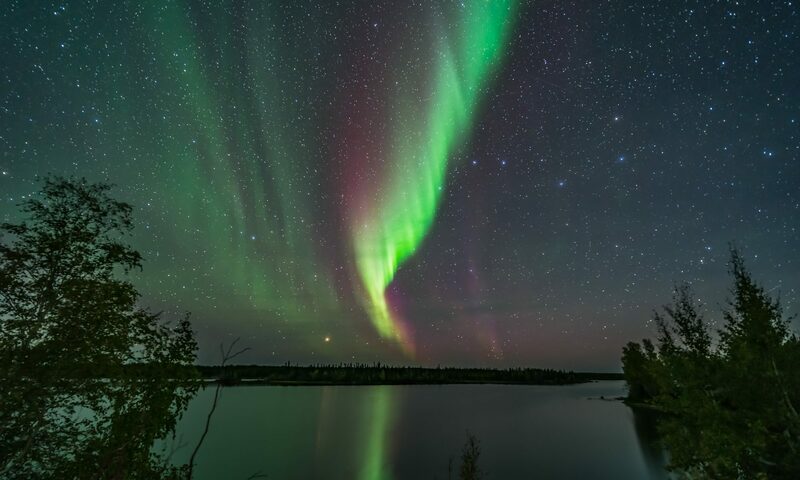 From Churchill, Manitoba the Northern Lights dance almost every night over the boreal forest. This year, as in the last two years, I have traveled to the shores of a frozen Hudson Bay and to the town of Churchill, Manitoba to view and photograph the aurora borealis. I’m instructing two tour groups at the Churchill Northern Studies Centre, one this week and one last week, in the science and sagas of the aurora and on how to shoot the Lights. The participants in the groups are fabulous, keenly interested and unfazed by the cold and wind. From Churchill’s latitude of 58° N, we are under the main auroral oval almost every night. Even on nights with low official activity levels, as they were on all the nights I shot these images, we still get sky-filling displays. Here’s a selection of still images from the last week of shooting, with clear skies on all but a couple of nights. There’s still room in our March sessions! Circumpolar star trails and aurora over the boreal forest at the Churchill Northern Studies Centre, Churchill, Manitoba, on Feb 9, 2016. This is a stack of 250 frames shot over one hour (until the battery died) for a time-lapse but here stacked for a single image star trail using the Advanced Stacker Plus actions and Long Streaks effect. Each exposure was 15 seconds at f/2.8 with the 15mm lens and Canon 6D at ISO 6400. An all-sky aurora display of multiple curtains of aurora borealis over the boreal forest at the Churchill Northern Studies Centre, in Churchill, Manitoba, taken on Feb 5, 2016. The view is looking almost due north. Jupiter is at right. The Big Dipper is at centre frame. This is one frame from a 380-frame time-lapse sequence shot for digital dome projection in planetariums. This is a 20-second exposure at f/5 (stopped down by accident — should have been f/3.5) with the 8mm Sigma fish-eye lens and Canon 6D at ISO 3200. Temperature was -35° C. But no wind! 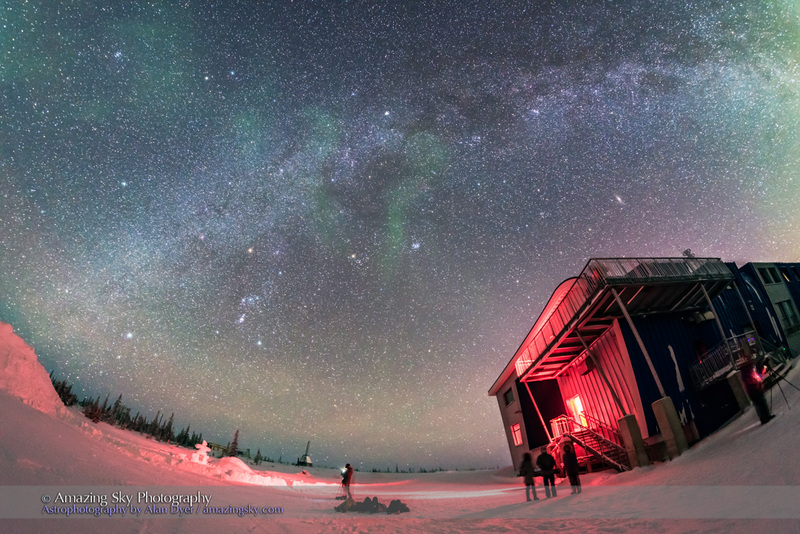 Participants in the Arctic Skies tour and course observe and photograph the Northern Lights from the upper level observing deck at the Churchill Northern Studies Centre, Churchill, Manitoba on Feb 10, 2016, the first night of their tour. A Level 1 to 2 display provided a good first night show though with bitterly cold temperatures and wind chills of near -50° C. This is a single exposure of 8 seconds at f/1.4 with the 20mm Sigma Art lens and Nikon D750 at ISO 3200. The Northern Lights over the Churchill Northern Studies Centre on Feb 8/9, 2016 during a weak all-sky display. The arcs lay primarily in the south when the display was at its best this night. Orion and the Pleiades are just setting in the west over the town of Churchill. This is a 20 second exposure at f/2.8 with the 15mm full-frame fish-eye lens and Canon 6D at ISO 3200. A panorama across the northern horizon of the sweeping curtains of the aurora, taken from the observation deck of the Churchill Northern Studies Centre, Manitoba. I shot this on Feb 10, 2016 on the first night of the Arctic Skies tour group week. Vega is low in the north at left of centre, Arcturus is the bright star at right of centre. This is a 4-segment panorama, stitched with Adobe Camera Raw, with each segment 5 seconds at f/1.4 with the 20mm Sigma lens and Nikon D750 at ISO 3200. Curtains of the aurora looking northeast and east toward Leo rising (at upper right) and Jupiter (at right), over the boreal forest of the Hudson Bay Lowlands near Churchill, Manitoba, on Feb 5, 2016. This is a single frame from a 680-frame time-lapse. This is a 4-second exposure at f/1.4 with the Sigma 20mm Art lens and Nikon D750 at ISO 3200. Vertical curtains of aurora converging to the zenith overhead over the snowy boreal forest at the Churchill Northern Studies Centre, Churchill, Manitoba. I shot this Feb 4, 2016 on a night with temperatures of -35° C with a slight wind. The Big Dpper is at right. Exposure was 10 seconds at f/2.8 with the 15mm lens anf Canon 6D at ISO 3200. 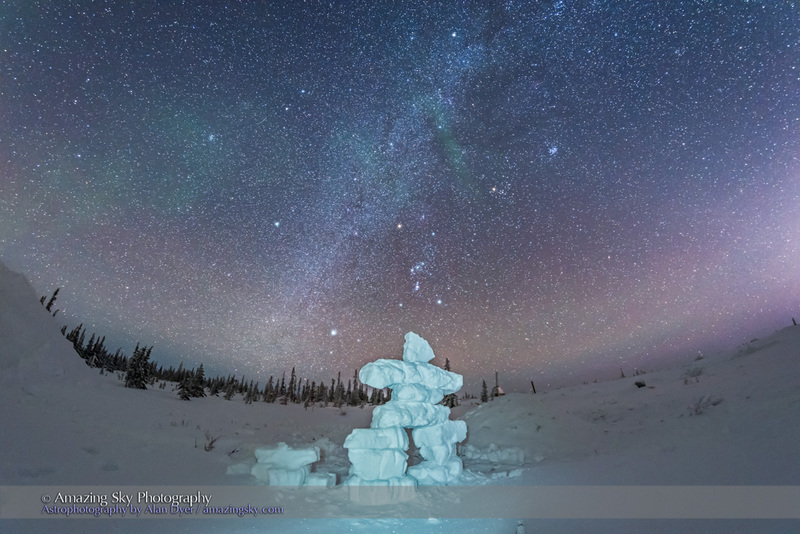 A lone figure gazes skyward at the aurora over the Churchill Northern Studies Centre, Churchill, Manitoba. I shot this Feb 4, 2016 on a night with temperatures of -35° C with a slight wind. Exposure was 13 seconds at f/2.8 with the 15mm lens anf Canon 6D at ISO 3200. A wide vertical portrait of the Northern Lights in the northern sky, with the stars of the Big Dipper and Polaris above centre. Shot from the upper deck of the Churchill Northern Studies Centre on a very windy night with wind chills of -50°, so standing in the wind to take this image was bitter! You grab a few images and retreat! This is a single 15-second exposure at f/2.8 with the 15mm lens and Canon 6D at ISO 3200. The February Arctic Skies tour group watching and photographing the aurora from the second floor deck of the Churchill Northern Studies Centre, where it is out of the wind, which this night was producing -50° C wind chills. This is a single 6-second exposure at f/2.8 with the 15mm lens and Canon 6D at ISO 6400. A self-portrait of me watching the Northern Lights from the upper deck of the Churchill Northern Studies Centre, looking south to the winter stars of Orion, Gemini and Auriga. This was Feb 11, 2016, a very windy, almost blizzard night with blowing snow and reduced visibility. However the aurora did appear through the haze and clouds. In the distance are the buildings of the old Churchill Rocket Range. This is a single 15-second exposure at f/2.8 with the 15mm lens and Canon 6D at ISO 3200.